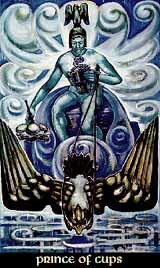 The Prince of Cups represents the Air above the waters, as the son of the Knight and the Queen - Fire and Water - he combines both the fiery flames and the watery depths of his parents, bringing them up in the heights of the Air, storming towards Yetzirah. So the Prince of Cups has all the emotional depths of the water, but also the intellectual values of the Air. He is clever and open minded, and his emotional soul can make him a sensitive artist or philosoph. Due to the heritage of Briah, he appears introverted and reversed, and indeed he tends to keep his secrets to himself. Like both his parents, he seems to be easy susceptible, but the sharpminded air makes him choose fairly what to accept in the end. On the shadowy side, the Prince of Cups can be reckless and selfish, always striving to improve his own goals and studies, carelessly sacrificing relations in order to perfectionate his art or passion , and he can be quite shifty in dealings.